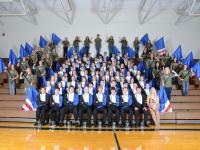 The Norris High School Band has established itself as one of the top band programs in the region. Norris Bands have competed and performed in Nebraska, Iowa, Missouri, Kansas, California, Florida, and the District of Columbia. The program is open to any students currently in grades 9-12 attending the Norris district. Groups in the program include the Marching Titans, Wind Ensemble, Symphonic Winds, Norris Jazz, Norris Jazz Combo, and Norris Pep Band.